New discussion features & 20 Writerly Questions! Little bit of an update for you folks this evening. I’ve got a few tweaks (not sure if I’d call them features) to the discussions within groups, and a shiny new sponsored group for you all to participate in. First off, we’ve launched our very first sponsored group this evening, courtesy of Random House of Canada’s BookLounge. I invite you all to check out and join the 20 Writerly Questions group — you’ll be able to read and discuss sets of 20 writer-related questions being posted on a regular basis by the marketing folks over at Random House of Canada. They’ll also be available to answer your questions, so feel free to drop by and chat! Not to mention, by joining the group, you’re also helping support Protagonize. So, what are you waiting for? Note: If you’re a publisher, organization, or individual (or anyone, really) interested in sponsoring a group on Protagonize, please feel free to get in touch with me directly. I’d be happy to fill you in with the necessary details. On a more feature-related note, you may have noticed a nifty new addition while browsing the discussion topics in our new sponsored group: images! 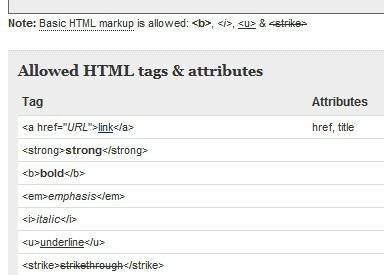 Yes, comments in discussion topics now support images, as well as a couple of other HTML tags that were previously not allowed. If you’re curious as to how the new image embedding works, check out any “Post comment” form in a group’s discussion area (see screenshot above) and you should see a new link at the bottom of the form labeled “Basic HTML markup“. You can click that link to see a full listing of allowed tags, as well as how to use them. Now, allowing users to embed images is an exercise in trust, so we’ll be counting on everyone to keep any images you post safe for everyone. Our moderators will be extra vigilant about deleting bad comments with this new feature. One Response to New discussion features & 20 Writerly Questions! Nick, I am certainly enjoying the new 20 Writerly Questions.